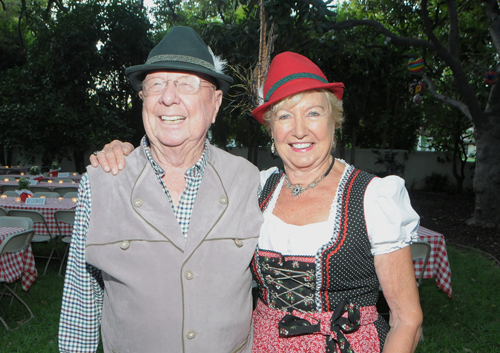 If you were among the lucky more than 170 guests who enjoyed themselves at the LOS ANGELES-BERLIN Sister City Committee OKTOBERFEST last Saturday, you will have had a truly memorable evening. The weather god was cooperating by providing just the right temperature for an outdoor event. There is no more beautiful setting than the garden of president/chairperson Rosemarie Reisch. 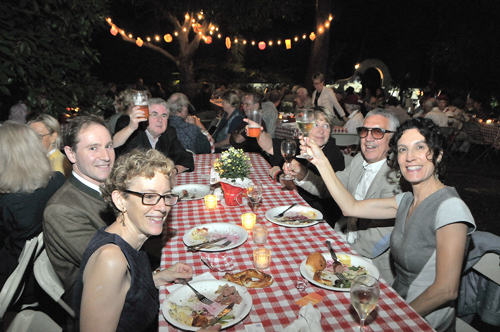 The majestic hundred year old trees were decorated with colored lights and lanterns, underneath them tables with red and white checkered table cloths, flowers and hundreds of votive lights completed the festive atmosphere. 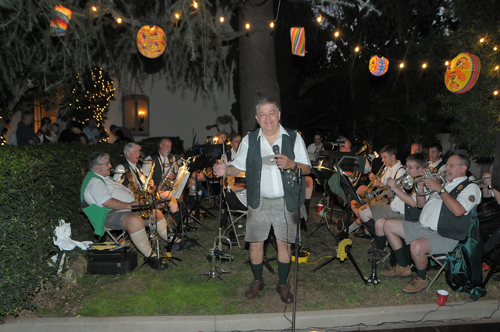 The 15 men (and woman) German-American Brass Band played all the popular hits that you would expect to listen and dance to in Munich and now in Southern California as well. The Oktoberfest Fare from Schreiner's Fine Sausages satisfied the discriminating palate as well as biggest appetite and beer and wine flowed freely. In her welcome of the members and guests of the Los Angeles-Berlin Sister City Committee the president especially thanked the sponsors: SIXT Rent a Car represented by Alexis Prieto, and Tim Vetters, branch managers for Santa Monica and LAX respectively as well as the most beautiful red electric Corvette right in the driveway; airberlin represented by Sabine Engelbrecht, as well as Continentalcolorcraft and Cobalt Design, who designed and printed the invitations. 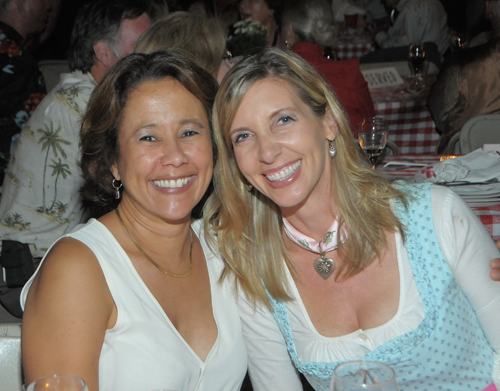 The owners Linda Clarke and Andy Scheidegger were among the guests having a wonderful time. 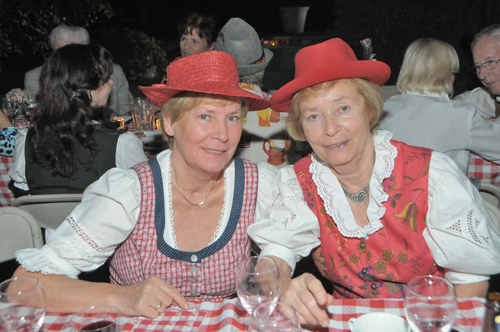 She also thanked Christiane Christiansen for her contributions to the success of the evening. 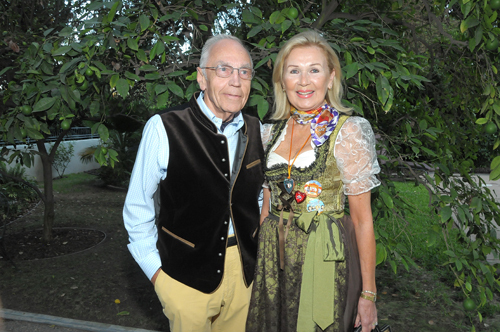 Rosemarie then gave the floor to Consul General Dr. Bernd Fischer who thanked the hostess and organization for their contribution to the close relationship between Berlin and Los Angeles and reminded the guests that this year Germany celebrates the 25th Anniversary of the Fall of the Wall and the reunification of a country that had been divided for 44 years. 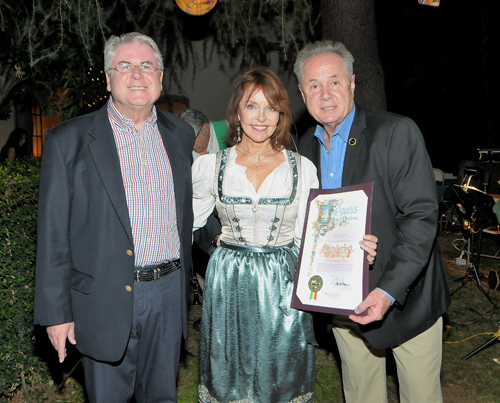 Councilmember Tom LaBonge (4th district), president of Sister Cities of LA, presented the Los Angeles-Berlin Sister City Committee with a "Certificate of Recognition" and thanked Rosemarie and the board for their tireless efforts and devotion to the cause of the Los Angeles-Berlin sister city partnership. 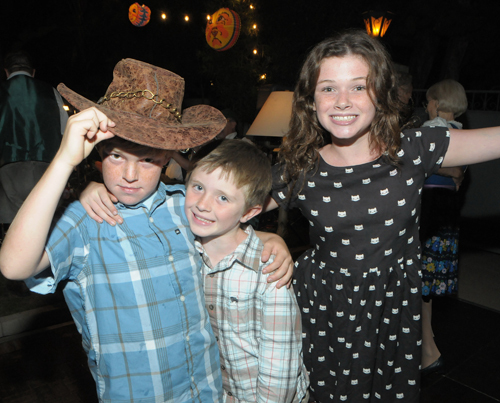 The evening continued with more of everything until the band had to stop for the 11pm curfew.